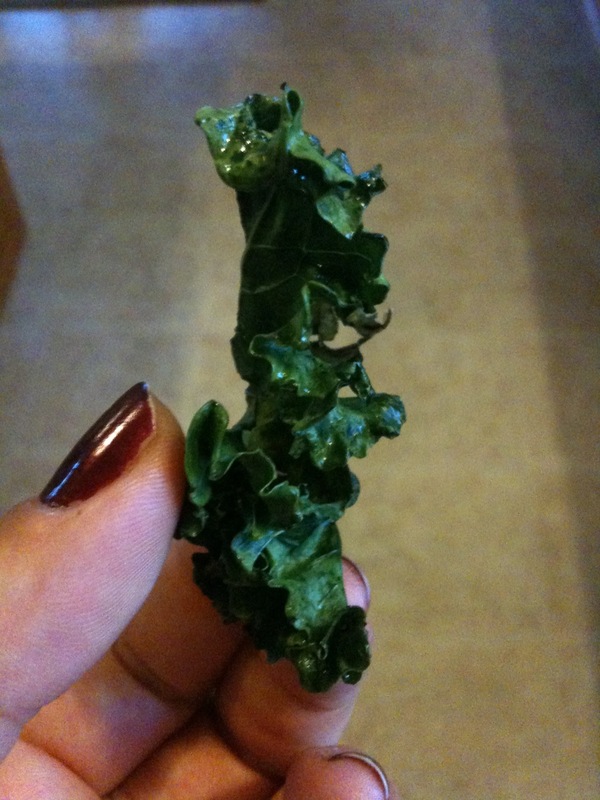 Kale is more than a salad bar decoration, my friend. It makes spankin’ good chips, too. It’s very easy, incredibly good for you (mountains of vitamins), and absolutely delicious. All you need is kale, olive oil, and salt! 1. Preheat oven to 300 degrees. 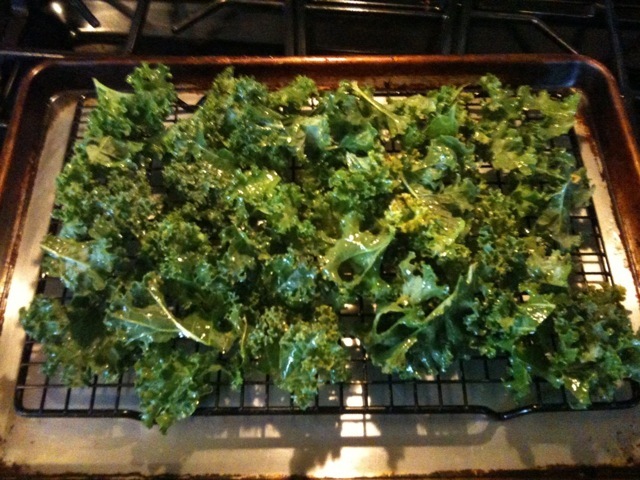 Wash kale, cut out inner stems, and tear into chip-sized pieces. Place in a bowl and drizzle with a small amount of olive oil. Toss gently until every piece is very lightly coated. You don’t want to over-oil; they won’t crisp up as well. For the amount of kale I had, I think I used a tablespoon or two. 2. Place oiled leaves on a drying rack on top of a cookie sheet. Try to get them on one layer. Leaves under other leaves won’t be as crispy. 3. Bake for about 20 minutes. Take a peak and give a leaf a nudge. They should be very crispy and maybe lightly browned around the edges. Mostly just crispy. 4. Sprinkle with kosher or sea salt, and enjoy! Omnomnomnomnom. I’ve been told by people with kids that this is THE way to get them to eat greens. This recipe is great for anyone who wants to add more leafy greens into their diet. Don’t be worried about the oil – Vitamin K is fat-soluble, so it needs a little fat in order to be used by your body. Wow – sounds wonderful! I have Kale still (from VA a week ago), and though I used a bit in a quiche, I still hadn’t decided what the best use would be for the remainder. Besides a salad bar decoration, of course. If these turn out, looks like this will be tonight’s green vegetable with dinner. 🙂 Thanks, Rachel!